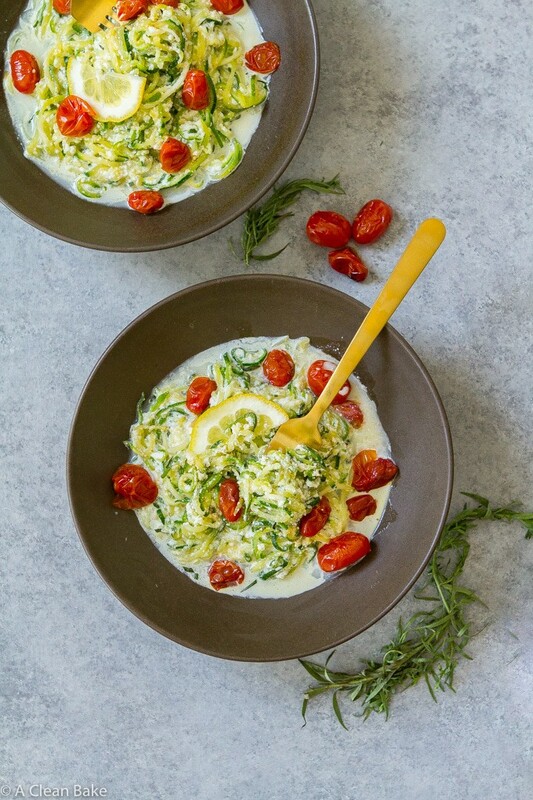 Dress up your zucchini noodles with roasted tomatoes, ricotta, lemon and tarragon for a quick and easy dinner that’s healthy and low carb/gluten free! I am finally home from Custer, South Dakota which, despite my reticence, actually shaped up to be a nice place to spend the week: nice weather, beautiful views, a minimum of hiking, and quiet. Not just outside – which, except for the chatter of various birds and frogs (maybe?) throughout the day and night, it was – but inside the small cabin, too. Not much space meant not much stuff, and a tiny efficiency kitchen meant simple meals, many of which cooked outside over the fire. I felt like such a pioneer woman. And no wifi which, despite my initial shock and horror, turned out to be kind of… amazing. While I wasn’t completely off the grid (I had cell service), not being able to: work, waste time watching nonstop Netflix, surf Facebook, and did I mention work? meant that I actually got the break I’ve needed for, well, an unhealthily long time. Sorry I left you hanging last week with no post, but instead of running around the state park looking for wifi, I read a fascinating book (and an eerily apropos one, given the news last week). I had the chance to reset my mind last week but now my body needs a bit of a reset. Our first stop (before South Dakota) in a tiny town in NW Iowa was lovely, but it’s the kind of place that you head to just knowing that it is going to mean a massive departure from your routine – especially nutritionally. Take the Standard American Diet, add cheese, top with bologna, and you have what we ate in Iowa. Well, I ate a lot of sandwiches in the hotel room at 11pm. Mysteriously, but thankfully, the local grocery store had gluten free bread. We did a little bit better in South Dakota, since we had a kitchen and I planned a pit stop for groceries at the Walmart on the way to the cabin. We did really well and despite what I will freely admit I thought of Walmart prior to this trip (hint: root of all evil/propagator of said Standard American Diet), I was very impressed. We got all the groceries for the week for a reasonable price and most of them were organic produce and eggs, wild caught fish, etc. So we ate well enough, but I spent a lot of the trip sitting in the cabin reading, snacking and not exercising while Baby Bake napped off the last several weeks of bad teething and grueling car rides, and I’m feeling it. You know: a little sluggish, a little headache-y, stiffer and less spry than you know you should feel and it’s time for a reset. 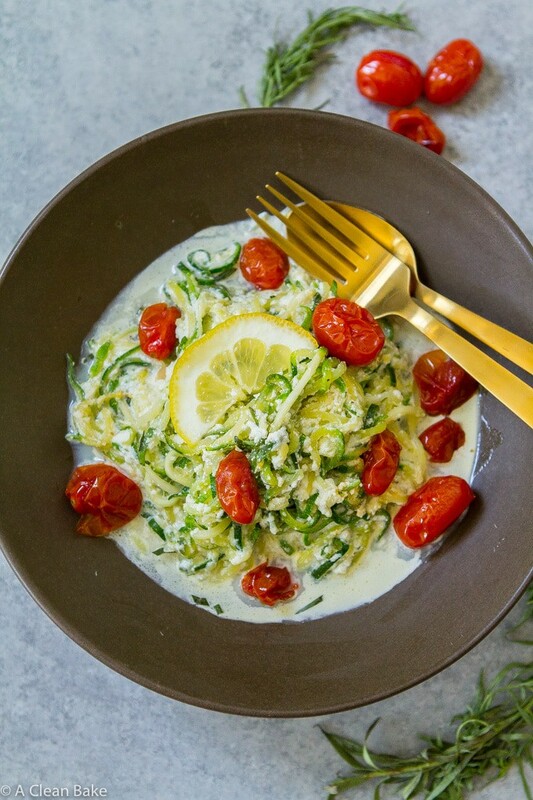 If you’re not familiar with vegetable noodles, you will need to borrow or invest in a spiralizer (I have this one), which cuts your veggies and fruit into these noodle shapes in much the same way an apple corer and peeler works (but results in a different shape). If you don’t have one and don’t want any new gadgets, just slice your zucchini into verrrry thin matchstick shapes, or get one of these julienning tools. I have one of these too. It is well worth the money and takes up no more room in your drawer than a vegetable peeler. 1) Use a dairy free ricotta. Kite Hill has one, or you can soak cashews over night, then blend them (or process in the food processor) with some of the soaking water and salt to taste until they achieve a ricotta-like consistency. 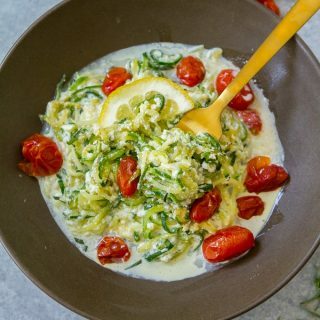 2) Skip the ricotta (toss the lemon, tarragon and other spices directly with the cooked zoodles without the ricotta) and serve with my green meatballs on top. I highly suggest using fresh tarragon in this recipe if you can find it. Since you won’t use the whole bunch, you can use the rest up in this recipe. If you don’t like tarragon, feel free to use finely minced parsley instead for a milder flavor. 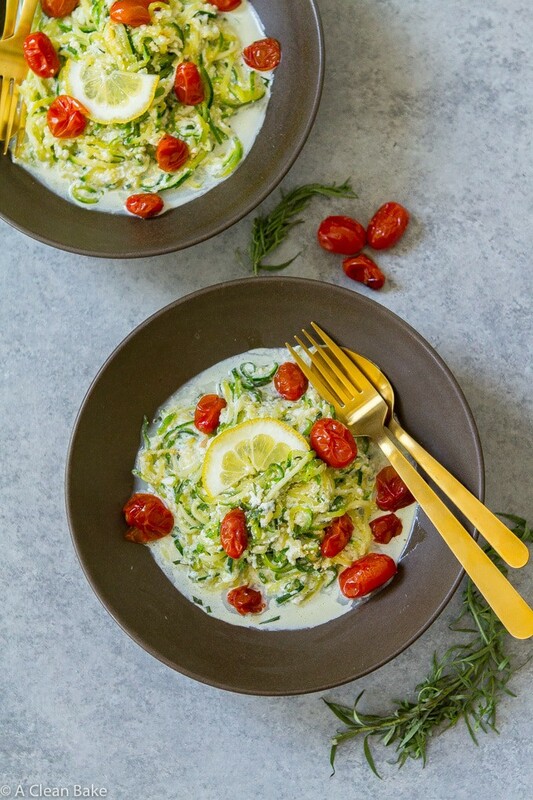 Dress up your zucchini noodles with roasted tomatoes, ricotta, lemon and tarragon for a quick and easy dinner that's healthy and low carb/gluten free! Preheat the oven to 400. 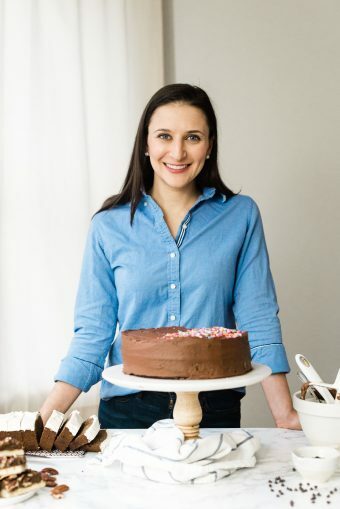 Line a baking sheet or pan with parchment paper and set aside. In a large mixing bowl, toss together the tomatoes, olive oil and salt until combined. Spread the tomatoes in an even layer on the prepared baking sheet or pan. Roast for 10 minutes or until slightly shriveled. Some of the tomatoes may have burst (that's ok). Preheat the oil in a large pan with a lid. 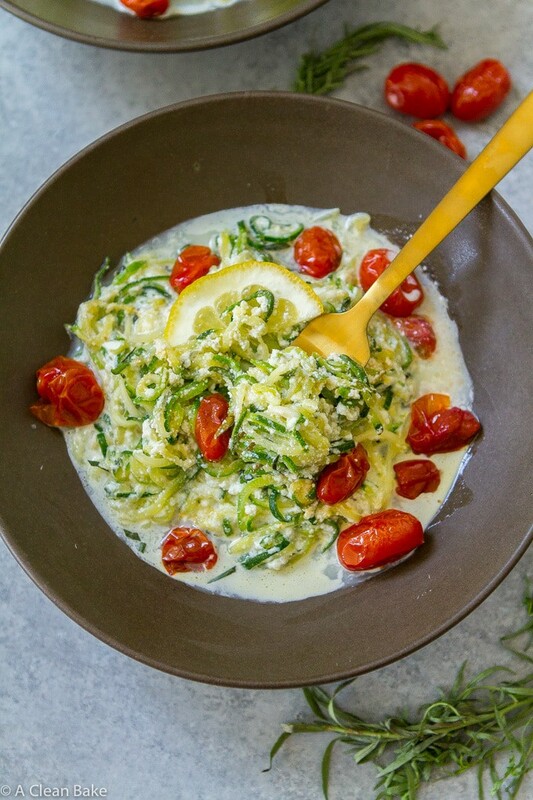 Add the zucchini noodles and sauté until softened. 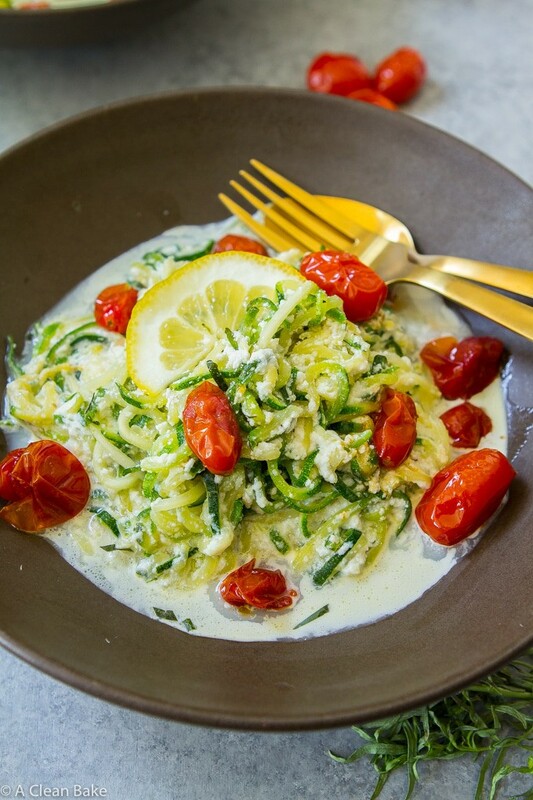 Stir the lemon juice into the ricotta. 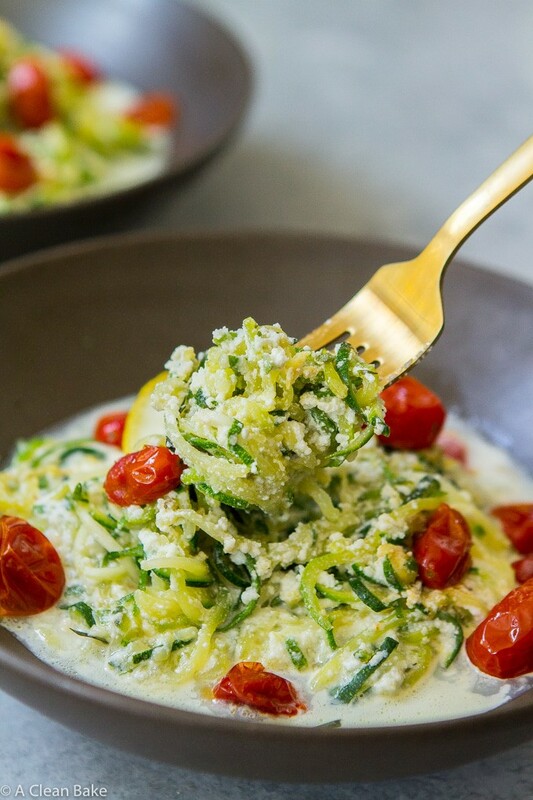 Add the lemon-ricotta mixture to the pan of zucchini noodles and stir to coat the noodles. Then sprinkle the tarragon, garlic, salt and pepper over the mixture and stir to combine. If you'd like a little more protein in this dish, you can top it with either chopped crispy bacon or halved hard or soft boiled eggs - or both.